Properties in Hilo International Airport (ITO) average 4.7 out of 5 stars. Paradise Found downtown Hilo in the country. Newly Remodeled ! Property 1: Paradise Found downtown Hilo in the country. Newly Remodeled ! CHARMING ! 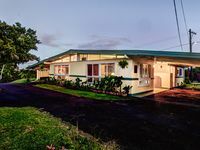 2bedroom Hawaiian Home on Hilo Bay ! Property 4: CHARMING ! 2bedroom Hawaiian Home on Hilo Bay ! NOW & ZEN !! Downtown Hilo Next to Reeds Island ! Property 5: NOW & ZEN !! Downtown Hilo Next to Reeds Island ! Aloha Falls Waterfall Sanctuary ~ Perfect Location on Big Island!! Property 7: Aloha Falls Waterfall Sanctuary ~ Perfect Location on Big Island!! Hilo"s Hale Hibiscus in Downtown Hilo. Newly opened !!! Property 9: Hilo"s Hale Hibiscus in Downtown Hilo. Newly opened !!! Family Friendly Home, with a Man Cave! Property 14: Family Friendly Home, with a Man Cave! Absolute Oceanfront! What a View! Like No Other! Read our Reviews! Property 22: Absolute Oceanfront! What a View! Like No Other! Read our Reviews! Sweeping Ocean View! Newly built home! Property 25: Sweeping Ocean View! Newly built home! Oceanfront Promontory w/ Stunning Views & Luxury Accommodations. Walk to Beach! Property 34: Oceanfront Promontory w/ Stunning Views & Luxury Accommodations. Walk to Beach! 3-level oceanfront home. NOT IN AREA WITH RECENT LAVA FLOW!!! Property 35: 3-level oceanfront home. NOT IN AREA WITH RECENT LAVA FLOW!!! Stunning, majestic, oceanfront location, with an unmatched view. Hilo 2 miles. Property 38: Stunning, majestic, oceanfront location, with an unmatched view. Hilo 2 miles. House of Paddles - Large Private Home with Pool. Property 45: House of Paddles - Large Private Home with Pool. Ocean Bluff Home on the Hamakua Coast ~ Great for Families! Property 46: Ocean Bluff Home on the Hamakua Coast ~ Great for Families! We really enjoyed the tropical area. I asked Diane if we can come early to check in and she allowed us to do so. I love their area and fruits around. We made a right choice to check out from hilton hotel to stay at Now &amp; Zen. Wonderful! The house was stocked with everything you could want on vacation. Close to town but private and felt a world away! Watching surfers was always entertaining. Definitely hope to be back.